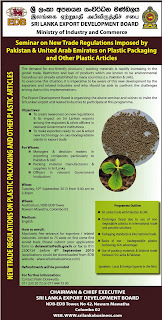 The demand for eco-friendly products / packing materials is rapidly increasing in the global trade. Restriction and ban of products which are known to be environmental hazardous are already established by many countries. (i.e. Pakistan & UAE). To overcome this situation, it is imperative to be aware of this new development by the exporters and related industries and who should be able to confront the challenges arising due to this Implementations. The Export Development Board is organizing the above seminar and wishes to invite the Sri lankan export and related industries to participate at this programme. 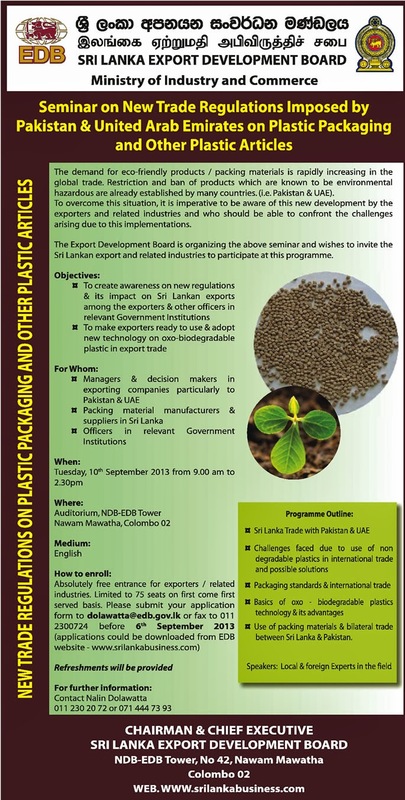 Use of packing materials & bilateral trade between Sri Lanka & Pakistan.